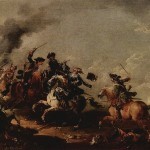 August Querfurt (1696-1761) is most well-known as a painter of soldiers and battle scenes. He was born in Wolfenbuttel, Vienna in 1696. His father, Tobias, a landscape and animal painter and the Brunswick Court Painter, was young August’s first teacher. He studied under Rugendas and spent most of his professional career in Augsburg, Vienna. His paintings were thought to be modeled on the works of Wouvermans. In 1752, Querfurt became a member of the Academy of Vienna. Querfurt painted a series of 12 paintings for Duke Karl Alexander of Württemberg. 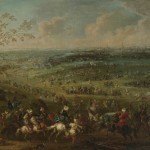 Two of those paintings, The Battle of Belgrade and The Battle of Blenheim were 11 meters by 4 meters. 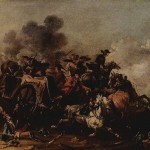 Querfurt painted 8 pieces for Empress Maria Theresa (1717-1780) of events from the War of Austrian Succession (1740-1748). The works for the Empress are now housed in the Museum of Military History located in Vienna. Querfurt lived during a very turbulent time. The Holy Roman Empire, The Ottoman Empire, the Hapsburgs, Great Britain and a number of other forces fought several battles in and around Vienna while Querfurt was living there. In some ways it was perhaps destined for the artist to primarily paint military landscapes of battles and portraits of soldiers as for much of his life, his country was at war. 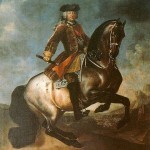 Querfurt died in Vienna in 1761.